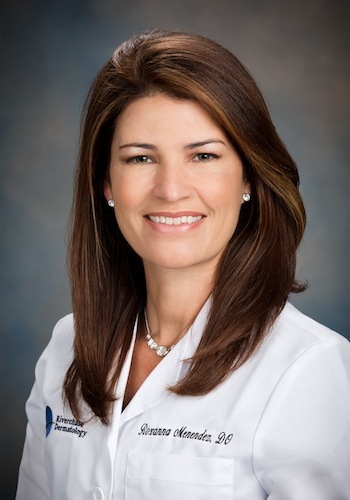 Riverchase Dermatology and Cosmetic Surgery is pleased to announce that Roxanna M. Menendez, DO, FAOCD, FAAP has joined the their team of providers. Menendez is board certified in both dermatology and pediatrics and will become the primary provider at Riverchase’s new Bonita Springs location. Menendez is currently accepting new patients for when the new office opens on Monday, January 6, 2014. Roxanna Menendez has a profound knowledge and expertise in adult and pediatric dermatology. She received her bachelor of science degrees in biology, chemistry, and psychology from the University of Miami in Miami, Florida. She then went on to earn a Doctor of Osteopathic Medicine degree from Western University of Health Services in Pomona, California. During her study, Menendez completed an internship in pediatrics at the Miami Children’s Hospital. She also served as a resident in pediatrics at Miami Children’s Hospital and a resident in dermatology at Columbia Hospital through the Palm Beach Centre for Graduate Medical Education and Nova Southeastern University. “I am very excited to join the team of providers at Riverchase Dermatology and Cosmetic Surgery. I look forward to using my skills and knowledge to provide an excellent experience for my patients at the new Bonita office,” says Roxanna Menendez, DO, FAOCD, FAAP. Dr. Menendez is an expert in using state-of-the-art technologies to provide a full range of diagnostic and treatment services for patients with skin cancer, skin diseases, and complex skin conditions. Menendez specializes in general dermatology, dermatologic surgery and cosmetic rejuvenation. She is also a Spanish-speaking provider. Menendez looks forward to meeting her new patients at the Bonita Springs office. For more information or to make an appointment, call 1-800-591-3376 or visit www.riverchasedermatology.com.